"A traveler! I love this title. A traveler is to be reverenced as such. His profession is the best symbol of our life. Going from ___ toward ___; it is the history of every one of us." — "Summer"
Explore Thoreau's maps at the Library of Congress. 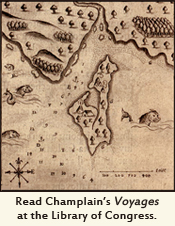 Read about Champlain at the John Carter Brown Library. 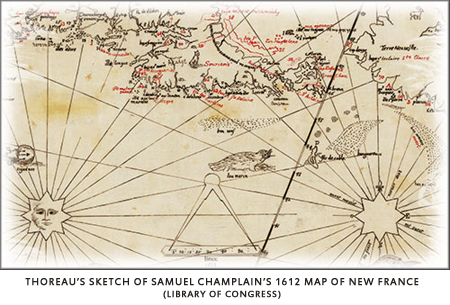 Visit "The Cartographic Creation of New England" at the Osher Map Center, University of Southern Maine. 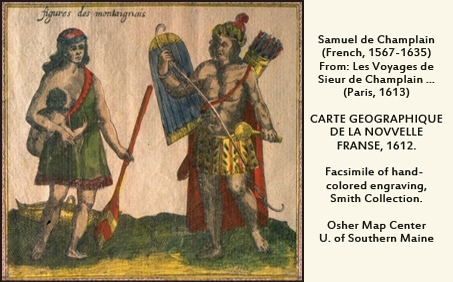 "In Champlain's Voyages...there is a map of [New England] made when it was known to Christendom as New France...a map extending from Labrador to Cape Cod and westward to the Great Lakes, and crowded with information, geographical, ethnographical, zoological, and botanical... 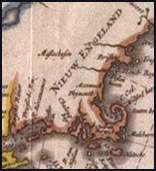 This, taken together with the many separate charts of harbors and their soundings on a large scale...makes this a completer map of the New England and adjacent northern coast than was made for half a century afterward." "In Thoreau’s map sketches and in the detailed commentary that he wrote about each them in his notebooks, I see the work of a very modern historical geographer. I see someone who is trying to reconstruct the lost landscape of New England, not only topographically, but also culturally. Thoreau is very concerned with the Native American population, their habits and living conditions and looks to maps to help him imagine what came before both linguistically and geographically. 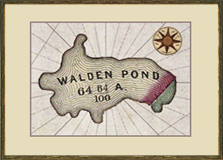 In his cartographic explorations Thoreau expresses himself in such detail that he can be considered as perhaps the first truly American geographer, who not only realized that the landscape that he was living in was a dynamic construction, but also that each cultural community and each generation imposed their own physical and cognitive map on the natural world they lived in."